So I thought I would check in before hopping on a plane next week to make my annual sojourn to Los Angeles for the Gallifrey One convention. I’ve had a lot of balls up in the air and I’ve been successfully juggling them for a few months now, so I thought I would post an update of everything I’ve got going on. First, since I already mentioned it, Gallifrey One starts next week at the Los Angeles Airport Marriott. I would tell you to get your tickets now, but it sold out shortly after tickets went on sale last year. However, if you are going to the con, be sure to check out the panel I’m doing called “”Rage Against the Sequel of the Light” on Friday, February 16 at 1 p.m. in Program C. We’ll be talking about the crazy world of movie sequels. Hope to see you there! The narration for the audiobook version of Zeus, Inc. is complete! Be looking for that soon on Audible.com. I’m really looking forward to hearing it myself. 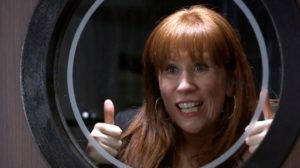 I wrote an essay on Doctor Who‘s Donna Noble for an awesome book called Children of Time: The Companions of Doctor Who. I’m not sure what the release date is on that yet, but I’ll keep everyone informed. It’s a great project, with a lot of great writers, as well as some fantastic art by Kelly Yates and Stephanie Lane Jackson, as well as a contribution by Jo Grant herself, Katy Manning. All proceeds from sales of the book will go to Furkids, Atlanta’s largest no-kill animal shelter and rescue organization. I’m still plugging along on Madame Vampire. I hope to have an announcement about that soon. But I am in final edits, so that’s great news! I’m also still writing for The Things and FanGirlConfessions.com. I also write for ScreenRant. Be sure to keep an eye on my Appearances page, too. I plan on adding a few more for 2018.